Sometimes, when Mama feels that my Amazing Big Brother’s interests have been driving the family outings rather too much, she tries to make a special effort to accommodate what she thinks might be particularly cool for me. Mama has this fond notion that I am a budding engineering genius, mainly because she feels I take after the practically-minded Papa and I do not have quite the same aversion to construction toys and anything involving manual dexterity as my Amazing Big Brother. Which is how we found ourselves standing at the bottom of this elegant looking metal structure, which allegedly lifts canal boats high up in the air to the next section of river in the sky, wondering how on earth it actually works. Because Mama’s theory prior to seeing it that it just goes straight up like an elevator was quite clearly wrong and unfortunately I might be able to slam a few building blocks together but this is quite out of my league. Currently. Luckily we did not have long to wait to find out. 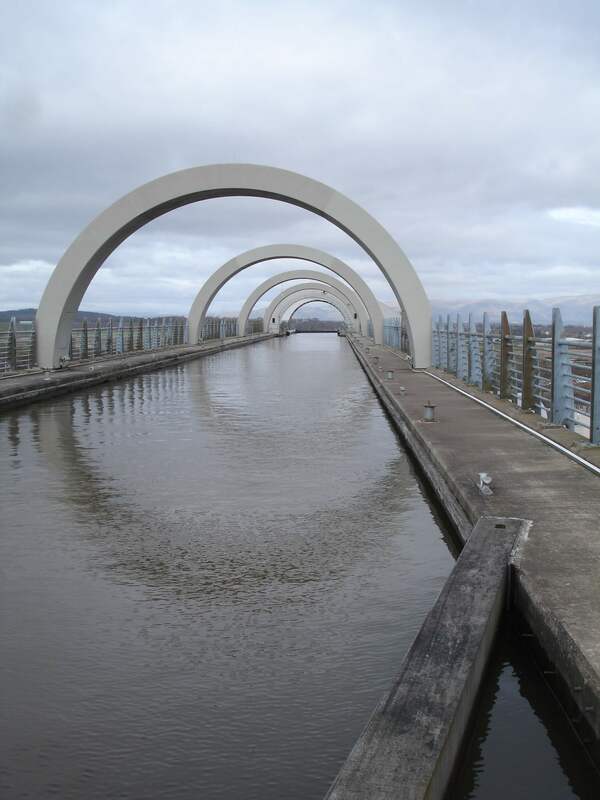 To make sure that the Falkirk Wheel is in use for the perhaps surprising number of people come to look at it, there are regular boat tours which start and end with a trip round the Falkirk Wheel and progress gently along the subsequent canal in-between times. Which you may need to book in advance if you, like we, go on a reasonably fine day in the school holidays. While we were there the queue was looking like a few hours wait at least until the next slot and Mama decided against it. 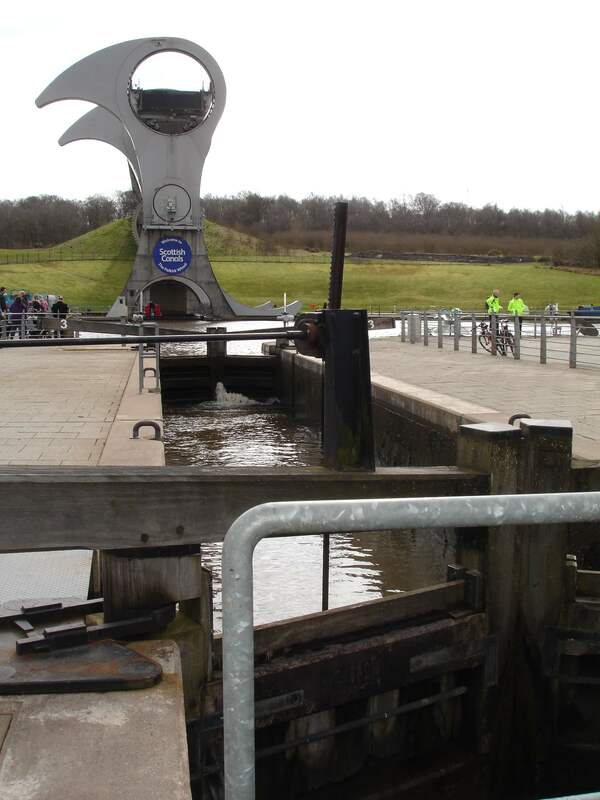 Instead, after we had seen the Falkirk Wheel do its thing, we climbed up to the higher stretch of the canal to see what this contraption looked like from the top. Waaaaaaaay cooooooooooooooool, in Mama’s opinion, she who spent a good deal of her formative years reading speculative fiction. Mama considers that the Falkirk Wheel from above is an excellent model for what some kind of futuristic transport system you could accelerate down and disappear in blizzard of sparks and a few licks of flame should look like. And at night, it gets all lit up. Imagine how excited Mama would get if we let her go and see that! We were more impressed by the tunnel and enjoyed the ten minute walk through and back where we could shriek and make echos to our hearts’ content. Until Mama, after an incautious question from my Amazing Big Brother, told us all about canals, HORSES and canal boats, people lying on their backs to walk the boats through the tunnels, followed by a very lengthy excursion around the industrial revolution. Which sounds smelly. Also, locks, the workings of and why the Wheel is an improvement, despite the fact that traditional locks are, Mama says firmly, a pretty damn nifty bit of engineering genius in and of themselves. A topic of discussion which was aided by the fact that back down below they have kept one of the eleven originals replaced by the Falkirk Wheel to, presumably, better contrast its method boat elevation with that of the older model. Which you are probably still wondering about. Well, the clue to the operation of this feat of man’s triumph over nature is in the name. 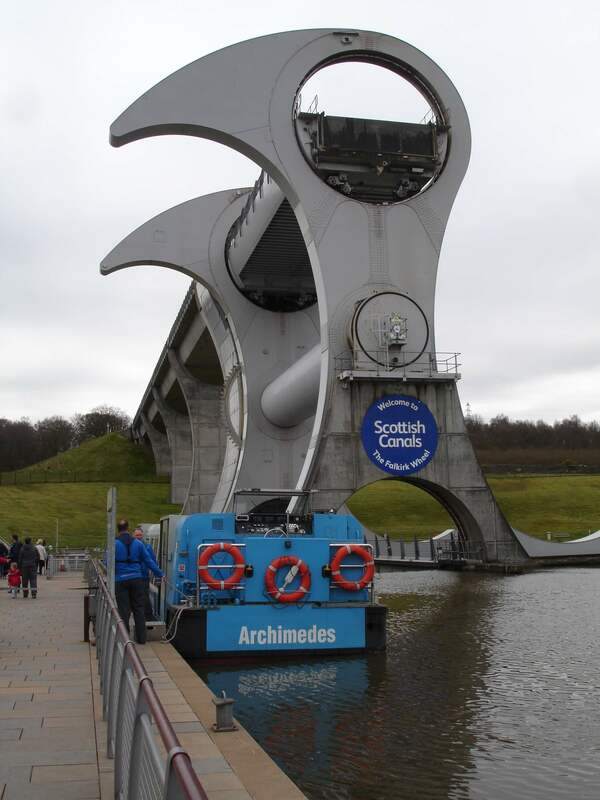 The Falkirk Wheel does not so much lift the boats up, as spin them around. It is genuinely awesome. The first three or four times, anyway. I’m not sure it needed to be photographed from every conceivable angle myself, but Mama clearly disagreed, and so we got to see it in action quite a lot. What’s particularly impressive, Mama thinks, is that you can move a boat up and one down with the same operation. From which you will gather that Mama is very lazy and admires efficiency of effort above all things. Although she does rather wonder why, a fair old while after the canals became obsolete as a serious method of transportation, Scotland has gone to the trouble and, more importantly, expense of building the thing. Still. What I say is that sometimes science and engineering just are, and we should marvel at them. Some people question the point of the space programme too, and that’s clearly crazy talk. However, it wasn’t all improving educational experiences. The other reason why Mama thought I might like the Falkirk Wheel is because of the water play ground in its shadow. The main damp inducing area wasn’t quite ready when we were there just before Easter, but a glorified multi-level paddling pool, with its own locks and pumping stations was. We got quite thoroughly wet. Luckily Mama had anticipated this, which was why she had saved this bit for last over our strenuous protests. A change of clothes was thus only a short squelch back to the car away. In even better weather, Mama thinks that parents should just go straight for the swim wear, or at least make sure whatever the kids are wearing it dries easily. There is also a dry playground too, if your children are less enthusiastic about getting sodden than we are. And other attractions include various woodland paths, some of which will take you to Roman remains. Allegedly. We were too busy sploshing about to want to take advantage of this or the café and various hot food vans dotted around. But Mama called time in the end and then we tried to action the third reason why Mama had chosen the Falkirk Wheel for me, which was that it is close to the gigantic horse-like Kelpies sculptures. Yes, that’s right, GIANT HORSE-LIKE STATUES! Sadly, Mama, who considers the signposting to the Kelpies from the Falkirk Wheel somewhat inadequate, got lost trying to find them and we ended up in Stirling, which is, apparently, quite some way away in the other direction. When we eventually did get back to the Kelpies there was a lengthy queue for the car park, so we bailed and only got lost twice more in the way back to where we were staying, resulting in a lengthy detour round an oil refinery. Which shoots real flame out of its chimneys! Not sure that this wasn’t more exciting than the Kelpies, to be honest. Luckily, Heather at My Life in Type has written about the Kelpies here, so you can find out all about them and the park they are set in. If you can find it. Anyway. Mama is now considering a trip down to see the Thames Barrier in action. Admittedly when she last did this she concluded that watching paint dry was more exciting, but this was possibly because she was an unimpressable teenager at the time and because she didn’t have the prospect of a a trip down the Thames on a river boat to sweeten it, which Mama has decided is the best reward for travelling to a more Easterly London location. And the highlight of the day for my Amazing Big Brother? 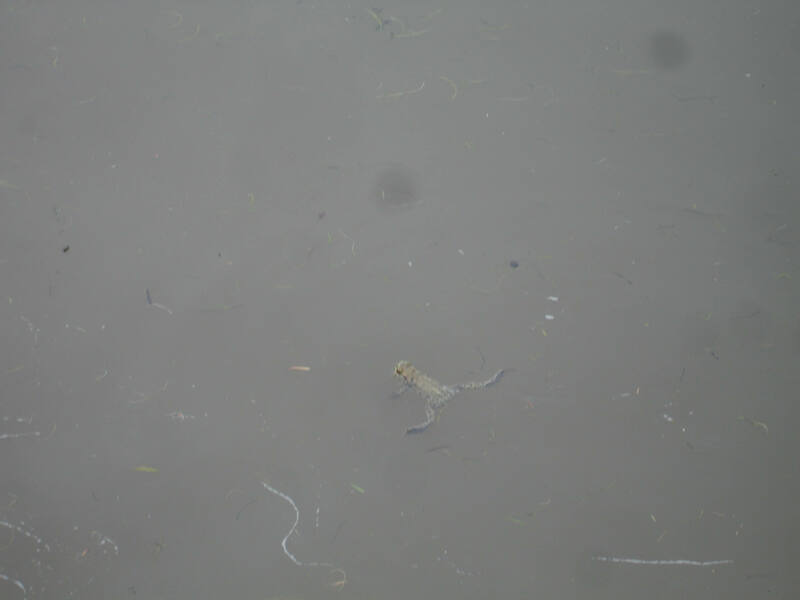 The frog that was sitting on the walkway next to the Falkirk Wheel when we first arrived. You can’t keep the next David Attenborough down with man-made genius at all, can you? 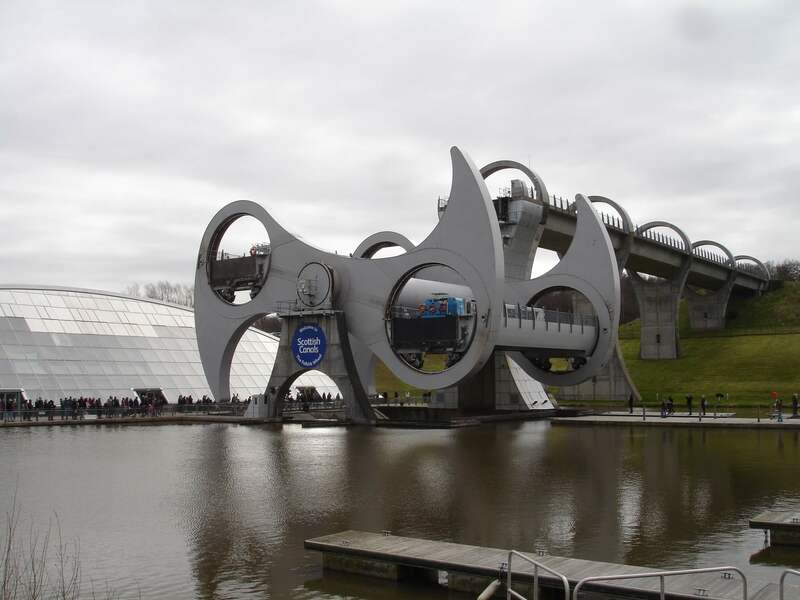 This is what the Hitchhiker’s Guide to the Galaxy has to say about the Falkirk Wheel. Opening: The Visitors Centre and boat trips are open from 10am to 5.30pm March to October. The site and play areas are closed by 8pm. Admission: Access to the site is free. The boat trips are £8.95 for adults and £4.95 for children (3+). You can get lunch/ tea deals too. Booking via the website can only be made prior to the day you want to go. Otherwise you need to phone or show up in person to book tickets. By car: For some reason the Falkirk Wheel is insistent that you should use junction 8 of the M9 from Edinburgh, which has the advantage that it will take you past the Kelpies. However, other exit options are available, and unlike the Kelpies, as Mama can attest having driven all over the area trying to find them, reasonably well signposted, especially if you head towards Falkirk. From the North, the website recommends exiting at Junction 9. From Glasgow you should take the M80, then the M876 and exit at Junction 1. The carpark costs £2 a day, but is extensive and very convenient. By public transport: There is a rail station in Falkirk, and the website recommends a taxi or the #3 First Bus route.